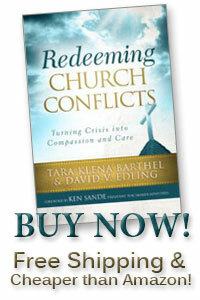 Q: What is the “Acts 15 Model for Redeeming Church Conflicts”? Taken directly from Scripture (Acts 15), we have organized “Redeeming Church Conflict” according to four main sections: Eternal Perspective, Discernment, Shepherd Leadership, and Biblical Response. You can view a video of us discussing “The Acts 15 Model” by clicking here. Q: We are familiar with the concepts of managing church conflicts and resolving church conflicts, but what does “redeeming church conflicts” mean? Q: Isn’t the goal when facing church conflict to simply bring it to an end as quickly as possible so things can get back to normal? Q: What is one “common denominator” you have experienced in your years as church consultants working with churches in conflict? Q: What is one core concept you teach church leaders in Redeeming Church Conflictsas you help them to respond to conflicts in a biblical, God-honoring way? Q: Group conflicts in the church can become very heated because an atmosphere of “them verses us” and competition to win begins to overtake other considerations. What is a sure sign that a conflict has been allowed to deteriorate to the point where serious long-term relational damage may occur? Q: In light of the last question and answer, when can church leaders and members alike know that they are regaining a biblical perspective on their conflicts? Q: In Redeeming Church Conflicts, you speak of the opportunities individual church members have to become leaders. What does that mean? Q: In your experience as church conflict consultants, what is one of the biggest mistakes you have seen churches make when trying to respond to their conflicts? Q: We live in an era where everyone demands guarantees of “success.” What do you mean by “success” when you help a church respond to its conflicts without undermining your commitment to God’s sovereignty over outcomes? Please note: These answers are taken directly from our book, Redeeming Church Conflicts (Grand Rapids, MI: 2012) and are used with permission.